Shawnee Mission East 41, Shawnee Mission West 0 –Wyatt Edmisten rushed for three touchdowns and Gunnar Englund added two scores as Shawnee Mission East shut out Shawnee Mission West 41-0. The Lancers will take on No. 2 Olathe North in the sub-state semifinals. They beat the Eagles 37-27 in the semifinals a year ago. Olathe North 27, Blue Valley 14 – Cole Murphy tossed touchdown passes to Venus Triplett and Josh Moore in the fourth quarter to break a 14-14 tie and defeat Blue Valley. Olathe North took a 7-0 lead in the second quarter on a Triplett touchdown run, but the Tigers’ Gannon Cornley returned the ensuing kickoff 93 yards for a scores. The Eagles regained the lead on a Marcel Spears run to be answered by Colton McCumber. Murphy passed for 207 yards and two scores, while Triplett rushed for 120 yards. The Eagles held Blue Valley to just 128 yards rushing on the night. Hutchinson 35, Derby 28 – Hutchinson led 35-21 at halftime and held on to win at Derby, 35-28. The Salthawks scored on the final play of the first half as Turner Wintz hit Ryan Stoecklein on a 27-yard touchdown pass. Derby pushed across the only points of the second half on a touchdown run by Curtis Whitten. Blaik Middleton led Hutchinson with 170 yards rushing and three scores. Wintz passed for 66 yards and added 158 yards on the ground. Brady Rust passed for 234 yards and a score and rushed for 73 yards and two scores for Derby. Lawrence Free State 37, Junction City 10 – After Junction City jumped out to 10-7 lead after one quarter, Daniel Clarke connected on three first-half field goals for Free State as the Firebirds took a 23-10 lead into halftime. Bryce Torneden rushed for a touchdown and returned an interception for another score for Free State. Torneden and Carson Bowen added touchdown runs in the third quarter as the Firebirds cruised to a 37-10 win. St. Thomas Aquinas 27, Leavenworth 7 – Aquinas scored 21 points in the second quarter to build a 27-0 halftime lead en route to a 27-7 win at Leavenworth. Kyle Bollig rushed for 129 yards and a touchdown on 25 carries for the Saints. Karter Odermann passed for 82 yards and a score, and added 84 yards and a touchdown on the ground. Leavenworth’s Sanchez Williams was held to 16 yards on eight carries. Shawnee Heights 34, Pittsburg 14 – Tony Barksdale Jr. scored five touchdowns as Shawnee Heights outscored Pittsburg 14-0 in the second half to win 34-14. The T-Birds broke a 14-14 tie with a Barksdale 7-yard run late in the second quarter to lead 20-14 at the half. Shawnee Heights intercepted Pittsburg four times – three by Austen Hubert. Barksdale rushed for 158 yards on the game, while Pittsburg Alex Barnes carried 29 times for 149 yards and a touchdown. Salina South 49, Maize South 28 – Salina South scored the first 21 points of the second half to pull away from the Mavericks. The Cougars led 49-14 before Maize South scored twice in the final three minutes of the game. Salina South led 28-14 at halftime helped by a Dalton Wassenberg touchdown run and touchdown pass. Eric McCullough rushed for more than 170 yards on the night. Wassenberg passed for 225 and three touchdowns – two to Dylan Becker. Bishop Carroll 48, Wichita Heights 7 – Colton Howell rushed for four touchdowns and passed for three more scores as Bishop Carroll, once again, routed Wichita Heights. Howell rushed for 76 yards to go along with his four scores and completed only four passes for 187 yards. Denzel Goolsby added 77 yards on the ground and caught one of Howell’s touchdown passes. KC Piper 24, Paola 14 – Colton Beebe rushed for 104 yards and three touchdowns on 21 carries as Piper beat Paola 24-14. The Pirates scored the first 12 points before Paola’s Ryan Gleghorn tossed a touchdown pass to Alex Wilson. Piper would answer with a Beebe run to lead 18-7, but Paola answered late in the first half as Gleghorn and Wilson hooked up again. The Pirates held the 18-14 lead until late in the third quarter when Ty Banes broke a 14-yard run for the 24-14 lead. Bishop Miege 47, Fort Scott 0 – Bishop Miege scored 26 points in the opening quarter and led 40-0 at halftime before a running clock in the second half. Miege quarterback Ryan Willis passed for 217 yards and touchdowns to Jafar Armstrong and Chris Ford. Dawson Downing led the stags with 104 yards and two touchdowns on 12 carries. Armstrong caught four passes for 138 yards. The Miege defense was impressive in holding the Tigers to 132 yards of total offense on the night. Buhler 38, Andover Central 14 – Buhler got yet another big night from Dillon Engelland and Jace Williams in racing past Andover Central, 38-14. Engelland rushed for 175 yards and three touchdowns, and Williams added 143 yards and one score. Williams also passed for 84 yards and a touchdown. Topeka Hayden 34, Mulvane 12 – Hayden led only 14-6 at halftime, but outscored the green Wildcats 20-6 in the second half to pull away. The Wildcats scored 34 consecutive points after falling behind Mulvane on an early fumble return for a touchdown. Jacob Head passed for 79 yards and two touchdowns to lead the Hayden Wildcats. Connor Schumacher led Hayden with 70 yards on the ground. Santa Fe Trail 14, Frontenac 13 -- Santa Fe Trail shutout Frontenac in the second half and came up with a couple of big defensive stops to preserve the 1-point win. The Raiders led 13-6 at halftime, but Santa Fe Trail pulled to within 13-12 on a Chaz Wright 6-yard run in the third quarter. Darric Cashier’s two-point conversion gave the Chargers a 14-13 lead. Frontenac later faced 4th-and-2 at the Charger 12-yard line and seemingly had a wide open receiver for a touchdown, but the ball was dropped. Later, the Raiders faced 4th-and-1 at the Charger 26, but Cashier stopped Frontenac quarterback Austin Seward short of the first down. Columbus 22, Holton 21 -- Trailing 21-15 and facing a 4th-and-goal from the 3-yard line, Columbus turned to standout back Jace McDown who plunged into the end zone with nine seconds remaining. 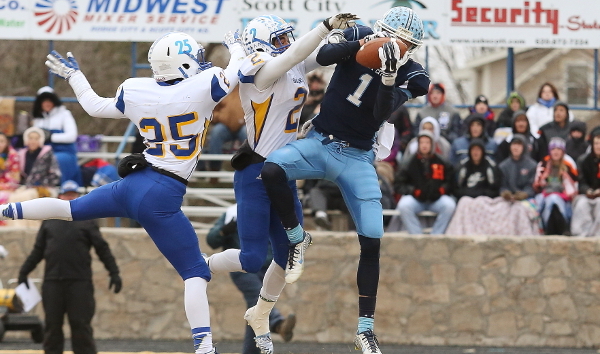 The Titans added the PAT to take a 22-21 lead and held on for the win over Holton. The Titans trailed 14-0 in the first half before pulling to within 14-7 at the break. Taylor Watkins broke a 37-yard touchdown run and the two-point conversion gave Columbus the 15-14 lead. Shortly after, Luis Butto’s 65-yard touchdown run gave Holton the 21-15 lead. Andale 47, Concordia 14 – A health Hunter Knoblauch is a good thing for the Andale Indians. Knoblauch rushed for five touchdowns as the Indians piled up more than 400 yards on the ground. Knoblauch led Andale with 210 yards on 25 attempts. Drake Hake led Concordia with 160 yards rushing and two touchdowns. Holcomb 49, Clearwater 14 – Holcomb built a 28-0 halftime lead on Clearwater and rolled to a 49-14 win. Brandon Stegman led the Longhorns with 143 yards rushing and a touchdown on the night. Blake Richmeier rushed for two scores in the first half. Trey Teeter passed for 139 yards and three touchdowns. Holcomb held Clearwater’s Hunter Hall to 63 rush yards on 21 attempts and intercepted him three times. Silver Lake 20, Wellsville 14 (OT) – Cole Baird scored from 10 yards out on Silver Lake’s first play in overtime to clinch the 20-14 win for the Eagles. Silver Lake had previously stopped Wellsville on downs on their overtime possession. Wellsville led 14-7 in the fourth quarter before Ryan Matzke hit Jace Freeman on a 41-yard touchdown pass to tie the game. Silver Lake will face Rossville again in yet another War on 24 to decide the east representative in the 3A title game. Rossville 56, St. Mary’s Colgan 19 – On the game’s opening kickoff, Thatcher Horak received the ball at the 5-yard line and was hit just past the 10, but kept his feet and weaved 95 yards for a Rossville touchdown. The Bulldogs would roll from there to a 56-19 win over St. Mary’s Colgan at Pittsburg State’s Carnie Smith Stadium. Tucker Horak rushed for 198 yards and six touchdowns, while Thatcher provided the other two. Rossville turned Colgan away twice in the red zone, and forced four turnovers including a pick-six by Tucker Horak. Colgan was led by senior Austin Commons who rushed for 191 yards. Halstead 66, Minneapolis 7 – Halstead rolled past Minnapolis 66-14 in a game the Dragons led 66-0 at halftime. Standout junior back Blake Beckett went 63 yards on the game’s first play and it was all Dragons from there. Eli McKee added consecutive touchdown runs and Beckett returned an interception for a score and a 30-0 lead at the end of the first quarter. Scott City 26, Wichita Collegiate 6 -- Scott City used a strong defensive effort to slow down the high-powered Collegiate offense. Scott City led 13-0 after the first quarter and added two more scores in the fourth quarter to lead 26-0. Wyatt Kropp rushed for three touchdowns for the Beavers, while Cooper Griffith finished with a game-high 117 yards rushing on the day. Trey O'Neil passed for 161 yards and a touchdown to Sloan Baker. Collegiate was led by Jaques Williams' 114 yards rushing on 20 carries. The Spartans scored late on a touchdown pass from Austin Waddell to Trevor Flamini. Troy 23, Lyndon 0 – Troy stopped Lyndon on the 2-yard line as the first half expired to preserve a 16-0 lead en route a 23-0 shutout of the Tigers. Troy quarterback Tristan Speer rushed for a short touchdown and tossed a touchdown pass to Collin Jasper in the first half. Derek Franken added a 7-yard touchdown run in the fourth quarter for the Trojans. Speer passed for 148 yards and rushed for 52 more. Franken led the Trojans with 71 yards on the ground. The Troy defense held Lyndon standout quarterback Dawson Swinehart to 39 rush yards on 15 attempt. Olpe 33, Onaga 22 – Onaga raced out to a 14-0 lead on visiting Olpe before the Eagles scored the next 33 points. Bo Krueger threw three touchdown passes and rushed for a fourth score for the Eagles. He hit Dugan Herrick on a pair of touchdowns and Wyatt Redeker on the other. Joe Redeker also returned a fumble for an Eagle score. The Eagles led 33-14 before Michael Bliss scored in the fourth quarter to pull Onaga to within 33-22. Ell-Saline 28, La Crosse 12 – Ell-Saline never trailed in knocking out top-ranked La Crosse 28-12. The Cardinals led 16-6 at halftime and carried that same 10-point lead into the fourth quarter. Quarterback Louie Arceo rushed for a touchdown mid-way through the fourth quarter to expand the Cardinals lead to 22-6. The Leopards answered with a two-play scoring drive to pull within 22-12, but Arceo scored again on a 41-yard run shortly after to make it 28-12. Phillipsburg 48, Oakley 12 – Phillipsburg has reached the state semifinals for the first time in school history with a 48-12 win at Oakley. Phillipsburg raced out to a 28-0 lead before the Plainsmen pulled to within 28-12 at the half. It was the Panthers second win over the Plainsmen this season as they defeated Oakley 49-21 back in Week 4. Hanover 74, Osborne 44 – Hanover outscored Osborne 28-14 in the second quarter to take a 44-22 lead into halftime. The Wildcats continually put pressure on the Bulldogs by scoring on each possession in the game. Hanover’s lead grew to 58-36 after three quarters. Jake Tiernan led Osborne with 161 passing yards and two scores. Andrew Bruna passed for 328 yards and three touchdowns for the Wildcats. Bruna also rushed for three scores. Central Plains 32, Ness City 0 – The Central Plains Oilers advanced to the state championship game for the first time in school history after shutting out Central Prairie League rival Ness City 32-0. Braedan Crites rushed for two touchdowns in the first half as the Oilers led 12-0. Crites then threw three touchdowns in the second half as Central Plains pulled away. Argonia-Attica 70, Axtell 44 – Alec McDaniel rushed for 150 yards and scored five touchdowns as Argonia-Attica outscored Axtell 70-44. Axtell cut the Titan lead to 34-30 early in the third quarter before A&A converted two Axtell fumbles into touchdowns to build a 56-30 lead and pull away. In just their second season of a co-op, Argonia-Attica advances to the state title game. Axtell couldn’t overcome five turnovers in the game. Victoria 28, Sharon Springs-Wallace County 12 – Brady Dinkel hit Joe Dortland on a touchdown pass to give Victoria an 8-0 lead over Wallace County at the half. The lead grew to 14-6 as Dinkel hit Noah Dreiling on a score and then 16-6 after Eric McAlonan tackled the Wildcats in the end zone for a safety. Bryan Dome then returned the ensuing kick for a touchdown and a 22-6 lead. The Victoria defense held Wallace County to 10 yards rushing on 35 attempts. Shawnee Mission East, Shawnee Mission West, Olathe North, Blue Valley, Hutchinson, Derby, Junction City, Lawrence Free State, St. Thomas Aquinas, Leavenworth, Shawnee Heights, Pittsburg, Bishop Carroll, Wichita Heights, Salina South, Maize South, KC Piper, Paola, Fort Scott, Bishop Miege, Topeka Hayden, Mulvane, Buhler, Andover Central, Columbus, Holton, Frontenac, Santa Fe Trail, Andale, Concordia, Clearwater, Holcomb, Rossville, St. Marys Colgan, Silver Lake, Wellsville, Scott City, Wichita Collegiate, Minneapolis, Halstead, Olpe, Onaga, Troy, Lyndon, La Crosse, Ell-Saline, Phillipsburg, Oakley, Hanover, Osborne, Central Plains, Ness City, Argonia-Attica, Axtell, Victoria, Sharon Springs-Wallace Co.